When it comes to lawn maintenance there is always a perfect tool for the job, then having a weed eater is no exception. There are so many gardening tools on the market today and choosing can be a bit difficult. That's why it is imperative you choose the right gardening tool for your needs. An essential tool you can get for your lawn is a weed eater. It may be mechanical, gas-powered or electric, it still makes does the same job cutting that pesky weed of your lawn. Here are the top best seven weed eaters in the market today. Last on the list is the Black & Decker ST7700. It is neither gas-powered or uses a rechargeable battery, but uses electricity plugged from the wall to run its motor. 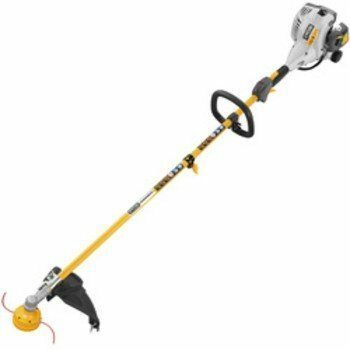 Though is a good type of weed trimmer that you can use without the limitation of changing batteries or filling the gas tank, just the downside that it is limited up to the length of the electric cord you have. Mostly this is perfect if you have a small lawn you need to maintain. The Black & Decker ST7700 has a Built-in auxiliary handle that can minimize wrist fatigue. It can cut an area of 13 inches with the 4.4 amp motor at 10,000 RPM. This product only weighs 4.5 pounds which are the lightest on the list. Black and Decker provides a 2-year warranty so you can be assured it is a reliable product. 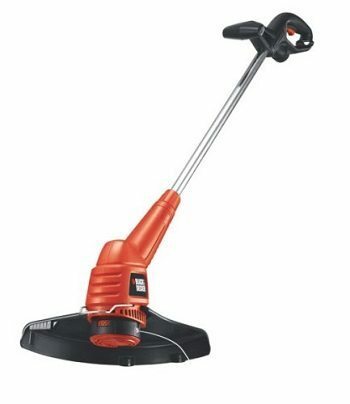 The Black & Decker LST136 is another weed trimmer that incorporates the use of a rechargeable battery to power its motor. Powerful 36-volt lithium ion rechargeable battery can provide the power with long run-time to complete the job. It uses a PowerCommand dial to choose between max power to max runtime to increase battery life and challenge thick weeds. It can easily converts from trimmer to edger with a quick turn of the shaft without having to modify anything using tools. Attached is an automatic feed spool that advances automatically so you don't have to bump. Charging time is approximately 1 hour, enough time to take some break during the day. Please note that the product is discontinued by the manufacturer, but if you find it brand new in a shop, don't hesitate to get one because it is sure made of high quality. 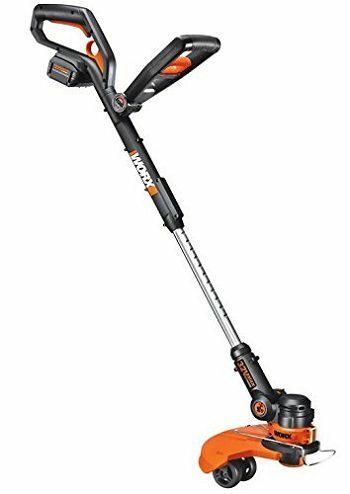 The WORX WG175 32-volt Lithium MAX Cordless Grass Trimmer is a type of weed trimmer that uses a rechargeable battery to power its motor. Perfect for users who want to go green and doesn't wish to smell gasoline fumes from gas-powered trimmers. This particular product has a wheelset so you can always level that desired trim you want. Has a 3-in-1 function and dual position wheels for grass mowing, trimming, and edging. Tool-free conversion from a trimmer to an in-line edger within seconds and with a quick-release lever fast adjustment of telescopic height up to 90-degrees tilt shaft. 32-volt cordless max lithium power battery equals to high power and longer runtime, and a 12-inch cutting diameter means you can cut more in an area. Overall weight is also decreased dramatically, weighing at only 6.2 pounds. If you enjoy weed trimmer in your spare time, this may be the product for you. The Echo SRM is an all around fantastic weed eater. Echo is a popular brand used among professional lawn care companies as it’s very easy to maintain and can handle heavy usage. One of our favorite features of this trimmer is its heavy cutting string. It is easily able to rip through just about any growth in your yard. Not to mention this string is extremely easy to reload. We also like that fact that it’s fast starting. No waiting around, yanking on it. One pull and go. If you are looking for a relatively quiet weedeater, then the Echo is the right choice for you. 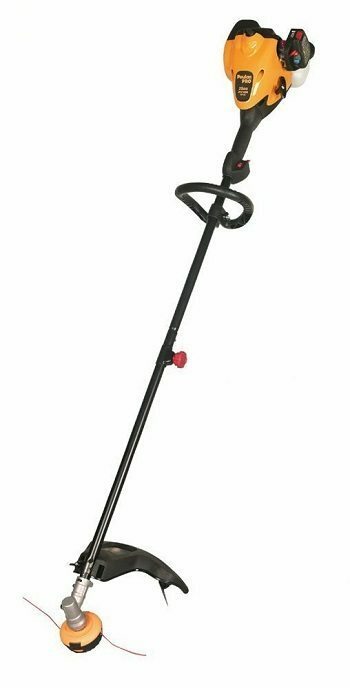 The WeedEater 967184401 W25CFK promotes a new design of weed trimmers which the shaft is curved to get that perfect cutting angle. Powered by an efficient yet powerful 25cc 2-cycle engine that is also low in maintenance. The cutting width is 15 inches with dual exit fixed line trimmer head. 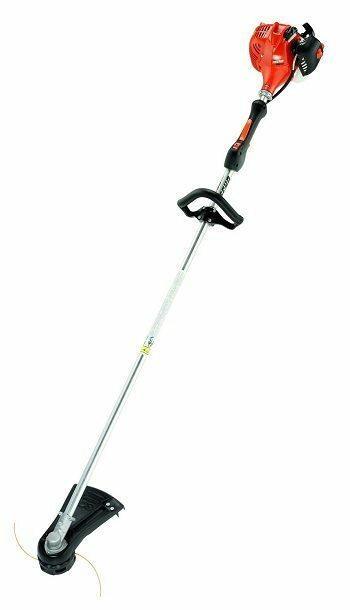 Product Dimensions are 10 x 10 x 40 inches and weigh 12.8 pounds, much lighter compared to other gas powered weed trimmers on the market. For starting, it incorporates a new 2-start system so you won't have a hard time turning on the engine. Many consider this to be a great value for your money because it only costs around $85. When looking for an affordable yet durable weed trimmer, this product may be the one you need. Next is the Poulan Pro PP125, though discontinued by the manufacturer, this product has many good user reviews. You might have a bit of a hard time to shop for this type of weed eater, but if you do find it, you’ll be sure to have your money’s worth. Powered by a SureFire 25cc 2-cycle engine, that generates very low emissions and best efficiency in its class. Other features include a 17-inch cutting width, .095-Inch diameter cutting line with dual exit and attachment capable. Product Dimensions: 33.9 x 11.5 x 11.2 inches and weighs 15.8 pounds. Even though this product is discontinued by the manufacturer, it is still considered to be one of the best trimmers that are easy to assemble, easy to start, cuts well and quiet running compared to other weed eaters out there. The Ryobi RY26520 26cc is the top pick for this list. It is gas-powered, so you don't need to worry about attaching an electrical cord, and you can cover a lot of areas. The engine on this weed trimmer is a powerful yet efficient 26cc 2-cycle low emission one horsepower engine with dual piston rings to provide greater compression and increased power. It incorporates an extended straight shaft for better reachability and trimming under any obstacle with attachment capable. Other features include: a hard chrome-plated cylinder for added durability and a StartEasy flip and go system for a smooth and flawless starting. Maintenance is very simple, for the air filter which is only a mesh screen that you can easily remove and clean. Some would advise that inserting a small foam can be good to filter out dust particles and to protect the internals of the engine. Also, this is a manufacturer refurbished product being sold. It is considered to be brand new with all the worn out parts replaced to a new one.